On June 26, 2009, the House of Representatives passed the American Clean Energy and Security Act (ACES) of 2009 (H.R. 2454). ACES provides a critical and effective framework to make the United States a world leader in advancing energy efficiency and addressing climate change. The bill establishes an economy-wide cap on greenhouse gas emissions and puts the United States on a trajectory to reduce emissions by 83 percent below 2005 levels by 2050. In addition, hidden within the voluminous bill are cost-effective energy efficiency provisions that are the “golden keys” to addressing the nation’s most pressing economic and environmental concerns. By creating a market-based incentive to reduce emissions through the lowest-cost means available, the ACES cap-and-trade program has the potential to be the most significant energy efficiency policy ever implemented in this country. The cap will encourage people to become more efficient and will drive innovation in energy efficiency technologies. According to a recent EPA analysis, under the ACES cap-and-trade mechanism energy consumption would not increase between now and 2050, thus avoiding the 17 percent increase in energy consumption through 2050 projected without the cap. ACES also addresses one of the greatest energy market failures—the carbon externality cost—but recognizes that other barriers to energy efficiency must be addressed as well. The bill creates a variety of complementary energy efficiency policies and provides funding for a variety of energy efficiency programs. Importantly, the bill also provides some safeguards to help ensure that allowances are allocated in a way that does not mute the price signal to electricity consumers and that cost-control mechanisms (namely offsets) do not undermine the carbon cap. ACES includes several policies to overcome barriers to investment in energy efficiency, including new and improved efficiency codes and standards, better consumer information, and transportation planning. Following are a few highlights. ACES includes an aggressive policy and timetable for the development and nationwide implementation of improved building energy codes. It encourages independent code-setting organizations to develop the codes and state and local governments to adopt and enforce them, but provides a federal “backstop” if they do not. ACES directs DOE to establish codes that achieve 30 percent savings within 1 year of enactment, 50 percent savings by the end of 2014 for homes and 2015 for commercial buildings, and an additional 5 percent savings every 3 years until 2030. DOE is to give technical and financial assistance to the code-setting organizations to develop the codes, but it would step in if the independent organizations did not meet the targets. purpose as well. If states do not meet the compliance targets, they will lose an increasing percentage of their allocation, and if they do not develop codes to meet the targets, DOE would enforce the federal energy code. The Alliance to Save Energy has strongly advocated for a comprehensive provision on codes because codes are an essential tool for improving the efficiency of new and renovated buildings but are not effectively used in much of the country. We estimate this provision alone could reduce U.S. energy use in buildings by 8 percent by 2030, for an estimated annual savings of 4 quadrillion Btu. ACES creates a combined efficiency and renewable electricity standard (CERES), which requires that 20 percent of electricity sales be met with a combination of renewable energy and energy efficiency by 2020. Energy efficiency program savings can entail up to one-fourth of the RES requirement (5 percent of total electricity sales), or two-fifths (8 percent of total electricity sales) if a state governor deems it necessary to meet the requirement. Eligible efficiency programs include customer electricity savings, combined heat and power and fuel cells, and reduced distribution system losses, with limited trading of efficiency credits. It is expected that many, if not most, utilities will meet as much of the CERES requirement with efficiency as they are allowed, since energy efficiency is generally less costly than renewable energy. The cap on the energy efficiency component of CERES severely limits the energy and monetary savings from the provision: the 5 percent efficiency gains will not exceed business-as-usual program savings expected under existing state-level energy efficiency resource standards (EERS) and other policies in many states, though 8 percent savings could provide a significant boost to utility energy efficiency efforts, especially since building codes and standards cannot be used to meet the energy efficiency component of CERES. Additionally, a late amendment to the bill discounts electricity from nuclear generating plants or plants with carbon capture technology from the baseline electricity use under CERES, significantly weakening the stringency of the standard. ACES establishes several policies to improve building efficiency. The Retrofits for Environmental and Energy Performance (REEP) program would facilitate home and commercial retrofits by providing performance-based grants for certifiable efficiency improvements. Under this program, commercial buildings would receive grants per square foot of demonstrated energy savings. This program would reduce the upfront costs of energy efficiency improvements while providing an incentive to achieve the most cost-effective energy savings possible. A model building performance labeling program established under ACES would reduce information barriers to building energy efficiency by directing EPA to establish measures of designed energy performance for different building types, develop one or more building energy labels, run pilot programs, and work with states and local governments to implement labeling and disclosure programs. An eleventh-hour amendment to H.R. 2454 reduced the labeling provision to new construction only, severely limiting its effectiveness on existing buildings. ACES also establishes new appliance efficiency standards—notably one on outdoor lighting—and makes a number of improvements to the process by which DOE sets standards. One provision would allow state building codes more flexibility to address the efficiency of heating and cooling equipment and lighting within the limitations of preemption of states by federal appliance standards. The Alliance estimates funding for energy efficiency in ACES would total more than $100 billion over the 2012?2050 period, an average of about $3 billion per year. Because energy efficiency shares funding with renewable energy and smart grid initiatives, it is difficult to estimate the exact funding total for energy efficiency, but our estimates range from $84 billion to $173 billion over the 2012–2050 period, averaging $2.2 billion to $4.4 billion per year. 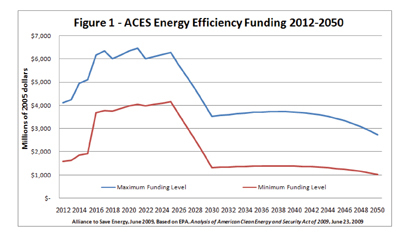 As long as the existing funding sources for energy efficiency do not decline, ACES funding could represent roughly a doubling of 2008 spending by utilities and state and local governments of $3 to $4 billion. Two dozen sections of ACES carry some potential for energy efficiency funding, and six sections of ACES specify that part of the allowance value must be used for energy efficiency. A couple of these provisions provide prescriptive programming language, but in most cases funding recipients are left to determine the program details and the role of energy efficiency. The other efficiency sections in the bill authorize programs but do not dedicate funding for energy efficiency; therefore, their funding depends on future appropriations. Of these allowances, as little as 20 percent or as much as 80 percent could be used for energy efficiency. Five percent of SEED allowances must be used for the REEP program&151;awarding performance-based grants for achieving energy savings in commercial and residential buildings—and would receive $7.4 billion in SEED funds over the lifetime of the program, or $200 million annually. On the whole, the SEED program could receive $30 billion to $118 billion for energy efficiency over the 2012–2050 period, averaging $800 million to $3.0 billion annually. While acknowledging that these spending levels would be a significant increase over historical levels of federal funding for energy efficiency, the Alliance continues to champion energy efficiency program funding as a primary cost-containment mechanism in climate legislation and a measure to ensure reductions in areas difficult to reach with a price signal alone. In the Senate negotiations, the Alliance asks that the strong complementary funding framework developed in the ACES be maintained and strengthened, and that new efficiency funding not simply displace current funding. Both these considerations are necessary to realize the full potential of energy efficiency savings under a cap-and-trade mechanism. One of the major concerns the Alliance has is with the bill’s provision for offsets. We believe it is critical that offsets be “real” (actually occur) and additional. ACES would allow a maximum of 2 billion tons of CO2 equivalent to be offset by credits for reductions in greenhouse gas emissions outside the cap. Carbon offsets can be an effective cost-containment tool, but only if the claimed emissions reductions are real. If the reductions are not real, the cap itself would be undermined, and the cost per ton of real emissions abatement would increase. Two billion tons of CO2 equivalent is roughly one-third of current U.S. emissions and twice the total allowed covered emissions in 2050. Offsets constitute an increasing proportion of total allowance over time, up to 60 percent in 2050. Given the magnitude of the offset program in ACES, the Alliance recommends that significant measures be put in place to ensure the offsets are real and additional. Offset regulations must prescribe how to address the great challenge of evaluation, measurement, and verification, as well as ensuring the entities tasked with making key decisions are independent of political pressure. Determining real carbon abatement from offsets is a challenging task, involving measurement and verification of emissions reductions and confirmation that the reductions occurred outside a business-as-usual framework. The Clean Development Mechanism, the world’s largest offset program, is expected to issue only 2.7 billion tons of CO2 equivalents (roughly 1.5 years of ACES legislation) in the 4 years between 2008 and 2012 and has already demonstrated the challenge of verifying offset credits. The program is fraught with controversy and no small amount of “hot air” (i.e., emissions reductions that would have occurred without the project investment). House negotiations on the jurisdiction of the offset provisions in ACES demonstrate the vulnerability of offsets to political pressure. ACES provides the EPA with jurisdiction over most offset projects—excluding domestic agriculture and forestry projects, which were transferred at the eleventh hour to jurisdiction of the U.S. Department of Agriculture. Hopefully, both entities will ensure that carbon offsets are rigorously measured and verified by upholding the Offsets Integrity Advisory Board and other oversight mechanisms established in ACES, but many of the details are still to be worked out. The Senate Energy and Natural Resources Committee has passed the American Clean Energy Leadership Act (ACELA), which is intended to be the energy title of a future Senate climate bill. It is expected that the Senate will consider climate legislation in October. Once this legislation is passed by the Senate, a conference committee will be convened to reconcile it with ACES. It is critical that the Senate bill maintain strong complementary energy efficiency policies. ACELA includes a number of important energy efficiency policies that will help achieve—and reduce the cost of achieving—a limit on carbon emissions. Building energy code provisions should remain strong and sufficiently funded. Energy efficiency provisions, either within a renewable electricity standard or a separate energy efficiency resource standard, should be robust enough to encourage real energy savings for consumers. Building energy efficiency labeling programs should be improved with adequate implementation and disclosure plans. The bill should increase funding for energy efficiency and ensure real and additional savings. Preserving at least the 3–6 percent of allowance value that goes to energy efficiency under H.R. 2454 is a must; increasing the value of allowances made available to energy efficiency should be a priority, since energy efficiency is a proven cost-containment strategy. Additionally, the Senate bill should add language ensuring that funding does not simply displace existing funding and results in real energy savings. If the allocation funding is used to displace existing funding, there would be no net increase in energy efficiency. SEED allocations should include support for retrofits and low-income weatherization. Additionally, the Senate bill should maintain and strengthen the provisions in H.R. 2454 relating to workforce development and investments in clean energy innovation, funding for research and development, and clean energy financing through the Clean Energy Development Administration to support innovation and facilitate the commercialization of new technologies. The Senate bill should ensure that allowance allocations do not discourage consumers or energy providers from aggressive deployment of energy efficiency measures and practices. While we recognize and applaud policy makers’ desire to ensure climate legislation does not unduly burden consumers or the overall economy, if free allowances to electric utilities are returned to customers in a way that offsets the carbon price in their electric bills, end-use energy efficiency would be underinvested, requiring other, more expensive abatement options instead. If these principles are followed and a strong climate bill is passed, the insulation industry stands to be a major beneficiary. Over the next decade, climate legislation in its current form is expected to create 1.7 million jobs impacting almost all sectors of our economy, including an estimated 250,000 new jobs in the energy efficiency sector.